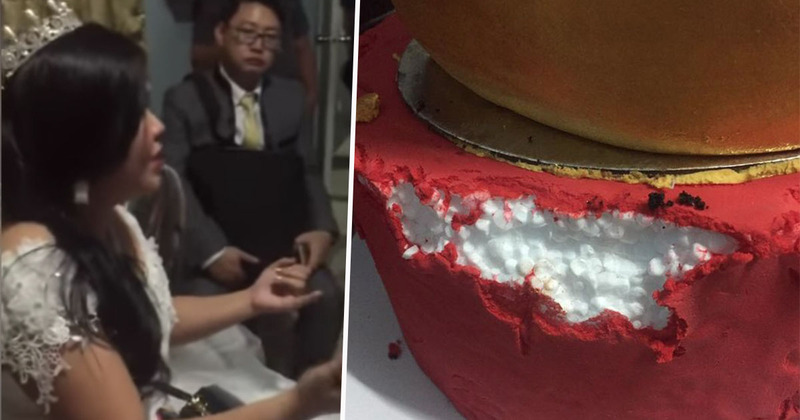 A bride and groom have been left devastated on their wedding day after finding out their wedding cake was made of polystyrene. The not-so-happy couple, 26-year-old Shine Tamayo and 40-year-old Jhon Chen, had forked out 140,000 pesos (£2,100) for food and decorations for their wedding day last month. All was going well. The ceremony went off without a hitch and it seemed – as all weddings should – like it was going to be a day to remember. And arguably it still was, just not for the right reasons. As Jhon and Shine arrived at the hotel where they were holding the reception, they found the catering company hadn’t brought any food. Which, y’know, is a bit of hitch when you’ve got dozens of guests who need to fuel up before hitting the dance floor. The bride and groom initially took it in their stride and swiftly ordered loads of takeaway from a nearby restaurant. Not ideal, but crisis averted… almost. As it came to time to cut the cake – something the catering company had at least brought with them – the happy couple sliced through the first tier, all going well, but as they got through the icing of the second tier, there was a shift in consistency. Turns out, the catering company had cut another corner and had made the bottom tier out of polystyrene, whacked some icing on it and thought nobody would be able to tell. Unsurprisingly, the bride and groom noticed, and, after the initial hitch of having to get takeaway instead of the food they were expecting, were understandably annoyed. The woman we paid to do the food has ruined my wedding. I have never been so humiliated in all my life. This was supposed to be one of my most treasured memories for my entire life. Instead it is the worst. The investigation into the wedding fraud is ongoing. The bride was very distressed by her cake and the food. We have confirmed that a large amount of money was paid for the service which was not delivered adequately. The provider has been interviewed and we intend to take the case to a trial. It was an emotional day to say the least. Even the cake was in tiers… Sorry.